You are 30-days guaranteed with a replacement or full refund, here is a no risk purchase for high class products. 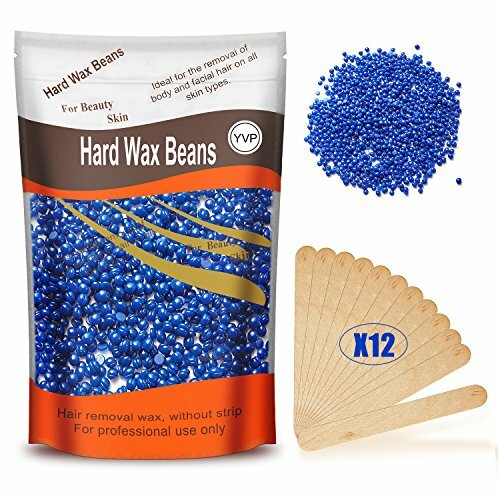 ○Take appropriate amount of wax beans into a depilatory wax heater to melt. ○Heat the wax to a working temperature, and using a spatula to stir the wax. Wait for 5 minutes to cool of the wax and then spread a layer of film wax onto the area to be treated in the direction of the hair growth. ○When the wax becomes cool,hard and holds the skin taut,remove the wax with a firm action against the direction of the hair growth quickly and strongly. 3.Do not use it within 2 hours after taking a shower,or sunbathing. 4.Rub a very small amount of wax on the inside of your elbow area to test allergic reaction before using. 5.Ensure the wax is not too hot before applying to skin, especially for eyes. 6.Do not use it if your skin suffered any adverse reactions to wax in the past. 7.The thickness of spreading wax should be among 0.3cm to 0.5cm to insure its using result. 8.If you are on medication that affects skin or you have a skin related disorder, consult your doctor before use. ○All waxing causes some pain. ○If the wax is not heated properly it will not spread properly, so make sure the wax is completely heated.Not all hair will be removed on all skin types only up to 90% off hair will be removed. ○To reduce pain apply pressure with your finger. ※ Ideal For Full Body Hair Removal: Perfect for those coarse, strong, long and deep grown hairs and sensitive skin. Lips, armpits, bikini line, eyebrows and delicate skin etc. It can remove above 90% of the hairs at one time. 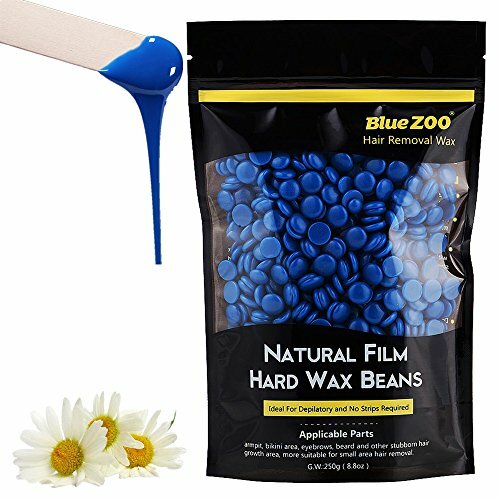 ※ Easy To Use: melt the wax beans->smear->quick rip off, no need for strips/cloth to help you remove it. ※ Safe To Use: The hair remove is a physical process, so it does not hurt the skin. ※ TIPS: Rip the strip from the skin quickly and small area of hair removal once can reduce the pain. After wax treatment, the skin may get red and fell sensitive, this is normal and will disappear within 24 hours. 1：relaxed and free of tension, stress and anxiety. 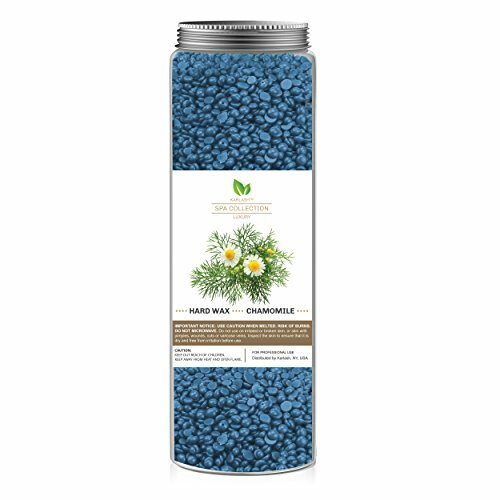 1: Sedative skin soothing sensitivity: This is the most basic effect of chamomile, can improve skin water, sensitive to the skin after the repair effect is more significant. 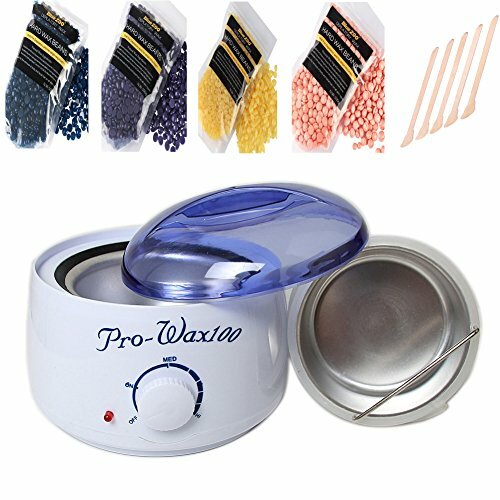 1：Heat wax pellets in a regular wax heater or in a glass bowl in microwave or over hot water and heat to a working temperature. 3：Allow a short period to cool and then holding the skin taut, remove wax with a firm action against the direction of hair growth. Method 1: Use the wax warmer will be highly recommended to melt the hard wax. ★【No Harm】Natural wax ingredients, The hair remove is a physical process,don’t hurt you skin. ★【Compatibility 】Use for Any of Your Body: Great for body face, Fingers, Armpits, LEG, ARM ARMPITS,BIKINI AREA and so on. ★【Easy to Use】There are no strips or pre wax oil required. Excellent for strong & fine hairs removal. Contain moisturizing Cocoa Butter, excellent for dry skin. 1. Put a appropriate amount of wax beans to the wax heater. 2. Turn the warmer to a certain temperature (adjustable) to melt. After melting, spread a layer of wax with a spatula on the skin along the direction of the hair growth. 3. When the wax dry out, remove the wax with a firm action against the direction of the hair growth quickly and strongly. 4. Please take a test on a small patch of the skin before using in case of adverse reaction. 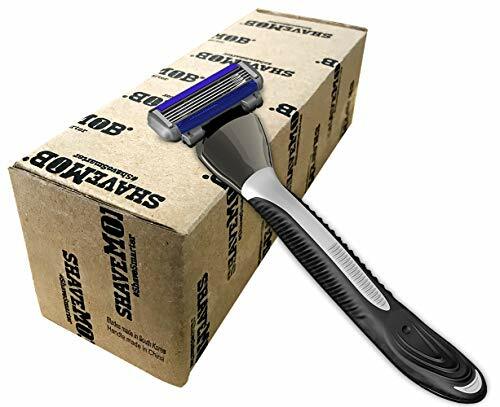 Shaving always remains a danger of hurting yourself. Hair regrows harder each time after shaving. Waxing removes the hair from the root smoother with long lasting effect. Hair regrows weaker, finer, softer sparser than shaving. a.Using the wand to take out appropriate wax to your wrist to test the temperature and determine the non-allergic phenomena. b.Ensure the wax is not too hot before applying to skin. c.Do not use it on broken or irritated skin. d.Do not use it if your skin suffered any adverse reactions to wax in the past. e.Do not use it within 2 hours after taking a shower, or sunbathing. f.If you are on medication that affects skin or you have a skin related disorder, consult your doctor before use. g.Please keep the wax beans away from children to avoid eating by mistake. h.Store in cool, dry place. Wax Beans: Widely used For Body multiple parts: Armpit, bikini area, eyebrows, face, nose, legs, back, neck, hands, beard and other stubborn hair growth area, more suitable for small area hair removal. Easy to Melt: Heat the wax to a working temperature by wax heater. Then using a spatula to stir the wax. Wait for 5 minutes to cool the wax beads and then spread a layer of film wax onto the area to be treated in the direction of the hair growth. Easy to Remove: Can tear off the wax from your skin directly by hand after the wax is cold and becomes hard, and it can remove above 90% of the hairs at one time, then you can use a tweezers remove the rest hairs or apply the wax a second time. Health Skin: Once finishing waxing off all the hair it will no doubt have random patches of wax that didn’t come off. Using a lotion that helps to slow the growth of the hair or massage an oil-based product into the skin,It exfoliates the skin painless, making your skin more softer and finer. 100% Satisfaction Guarantee: You are ensured that100% satisfied with our products!! There is no risk purchase. If you have any doubt, please sent us an email before any action, we will give a satisfactory solution. To have a better hair removal, please keep the melted wax temperature about 42◦C/107◦F. If the temperature of melted wax is lower than 42◦C/107◦F, it can NOT remove hair. However, Be careful, do NOT be too hot to your skin! If you have any problem about wax, please contact with us for User Guide! You are 30-days guaranteed with a replacement or full refund, here is a no risk purchase for POP MODERN.C’s high class products. – Ensure the wax is not too hot before applying to skin. – Do not use it on broken or irritated skin. – Do not use it if your skin suffered any adverse reactions to wax in the past. Do not use it within 2 hours after taking a shower, or sunbathing. – If you are on medication that affects skin or you have a skin related disorder, consult your doctor before use. 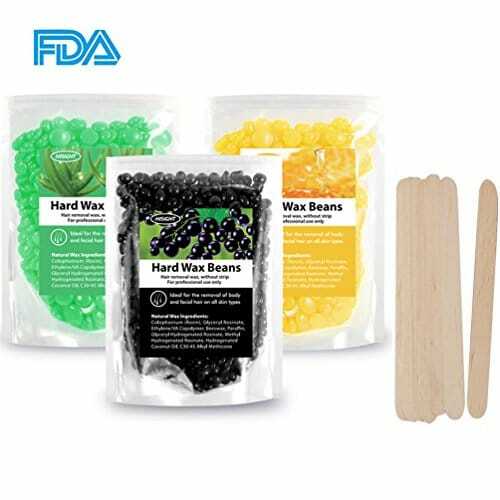 LESS PAIN & REMOVE HAIR CONVENIENTLY – Remove Unwanted Bodily Hair Easier – POP MODERN.C Hard Wax Beans Offer High Quality Stripless Depilatory Hot Wax Which Ensures That All Your Hair Come Off Easily, And With Significantly Less Pain Compared To Any Other Types of Waxing. EASY TO USE – There’s No Need To Use Strips or Cloth. This Wax Hardens by Itself And You Simply Pull It off Smoothly, Without Applying Strips On Top. SPEND LESS MONEY & PRIVACY –You No Longer Need to Spend A Fortune at Beauty Salons To Get a Brazilian Wax Any More. Not Everybody Likes To Get Naked In Front of Strangers. We Get That! Waxing in Private Allows You to Enjoy Discreet Waxing While Achieving Professional Results. Do It Easily At Private Place . HIGH QUALITY & SAFE FDA Approved, Made From Certified Natural Ingredients, Lavender Smell, Non Toxic and No Harm to Your Health. The Hair Remove Is A Physical Process,Don’t Hurt Your Skin. Made of mild ingredient, which will remove your unwanted hairs comfortably while nourish, smooth and tighten your skin. It can be used for hair removal in armpit, arm, leg and other body parts. Such a good product, just bring it home! Features: Adopting natural and pure ingredients to ensure it is harmless and without stimulation to your skin while hair removal. Add the soothing ingredients of natural care on the basis of pure physical hair removal and different skin types, which can reduce skin irritation and strengthen hair removal effect. Special produced based on human body hair structure, like hair length and hardness, which will be better for removing the hair or delay its growth. Excellent grip on strong & stubborn hairs, can be used on all areas of the body, like face, arm, legs, underarm, etc. No depilatory paper are required, heating the wax bean and using the spatula apply the wax on skin directly, very convenient to use. Adopting natural and pure ingredients to ensure it is harmless and without stimulation to your skin while hair removal. Add the soothing ingredients of natural care on the basis of pure physical hair removal and different skin types, which can reduce skin irritation and strengthen hair removal effect. Special produced based on human body hair structure, like hair length and hardness, which will be better for removing the hair or delay its growth. Excellent grip on strong & stubborn hairs, can be used on all areas of the body, like face, arm, legs, underarm, etc. No depilatory paper are required, heating the wax bean and using the spatula apply the wax on skin directly, very convenient to use. 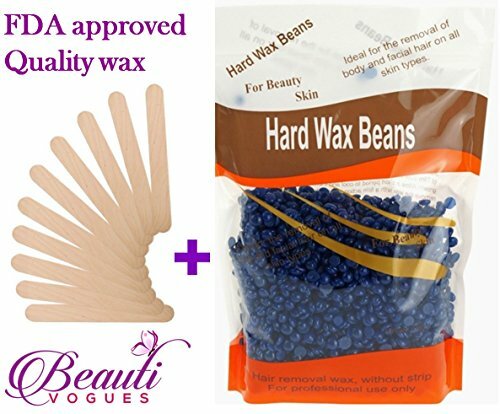 Why to chose BeautiVogues Hard Wax Bean? 1.Take appropriate amount of wax beans into a depilatory wax heater to melt. Clean the skin and keep dry before waxing. 2. Heat the wax to a melting temperature, after the wax melted, apply a little melted wax on your wrist to test for the suitable temperature. 3. Spread a layer of wax with a spatula on the skin along the direction of the hair growth. 4. Wait about 1-3 minutes till the wax dry and become a film. Pick up the downward end of the film. 5. Holds the skin taut, remove the wax with a firm action against the direction of the hair growth quickly and strongly. 6. Apply some suitable skin care lotion or warm towel to eliminate skin uncomfortable after waxing. 1. For professional use only. 2. Ensure wax is not too hot before applying to skin. 3. Do not use on broken or irritated skin or if you have suffered any adverse reactions to waxes in the past. 4. If you are on medication that affects skin or you have a skin related disorder consult you doctor before use. 5. Do not use within 2 hours of showering, bathing or sunbathing. 6. Do not let depilatory wax or depilatory wax paper stayed a long time on the skin. Less painful than traditional wax.No Strips Required. A high performance wax for traditional hot wax users. Suitable for hair removal on all parts of the body. Particularly effective on the bikini area. Tried, tested and loved by salons, can be used in salons, spas by mobile therapists and at home. Have you ever encountered such a problem? That you want to wear Bikini and go to the beach, but you are afraid of friend’s laughing by the hair on your arms, legs or bikini line? 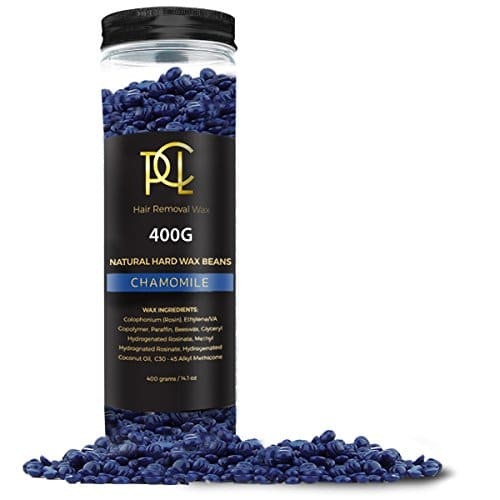 The Hard Body Wax Beans will help for hair removal simply, make you more confident and have more fun. Ideal for all types of skin: For hair removal on all body parts, armpit, bikini area, eyebrows, beard and other stubborn hair growth area, more suitable for small area hair removal. 1. Take appropriate amount of wax beans into a depilatory wax heater to melt. Do not put too much waxy beans. 2. Heat the wax to a melting temperature,after the wax melted,spread a layer of wax with a spatula on the skin along the direction of the hair growth. 3. When the wax becomes cool,hard and holds the skin taut,remove the wax with a firm action against the direction of the hair growth quickly and strongly. 1To have a better hair removal, please keep the melted wax temperature about 42◦C/107◦F. If the temperature of melted wax is lower than 42◦C/107◦F, it can NOT remove hair. However, Be careful, Ensure the wax is not too hot before applying to skin. do NOT be too hot to your skin! 4. Do not use it within 2 hours after taking a shower,or sunbathing. 5. If you are on medication that affects skin or you have a skin related disorder,consult your doctor before use. 1. 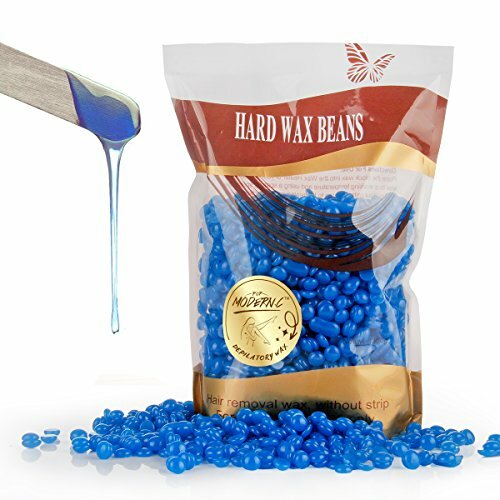 The Hard Wax Beans is Ideal For Depilatory and No strips required. Can tear off the wax from your skin directly by hand after the wax is cold and becomes hard. Natural wax ingredients, skin friendly, Painless hair removal, Do a depilatory yourself at home, fast and efficient! 2. 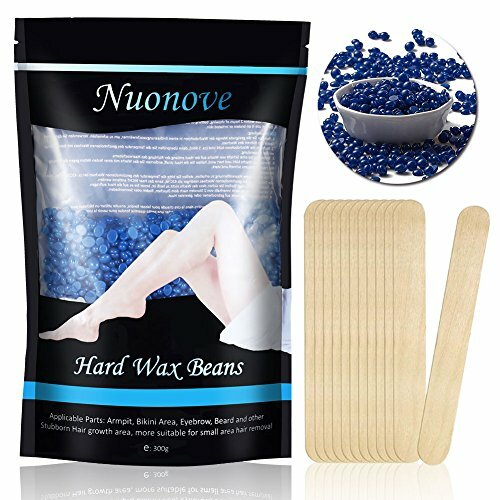 Suitable For All Areas Of The Body: The Hard Wax Beans is ideal for hair removal for legs, armpit, bikini edge area, chest, back, face, and no strips required. 3. Easy To Apply: Heat the hard body wax bean to a working temperature by wax heater. Then using a spatula to stir the wax. Wait for 5 minutes to cool the wax beads and then spread a layer of film wax onto the area to be treated in the direction of the hair growth. then tear off the wax from your skin directly by hand after the hard wax bean is cold and becomes hard, and it can remove above 90% of the hairs at one time. 4. Note: To have a better hair removal, please keep the melted wax temperature about 42◦C/107◦F. If the temperature of melted wax is lower than 42◦C/107◦F, it can NOT remove hair. However, Be careful, do NOT be too hot to your skin! A Frequently Ask & Question User Guide will be sent to your email address, make sure your email box can receive it. Or you can email us and ask for it. Make your home salon and DIY hair removal easily & simply!! You are 30-days guaranteed with a replacement or full refund, here is a no risk purchase for Pure Clean Love’s high class products. 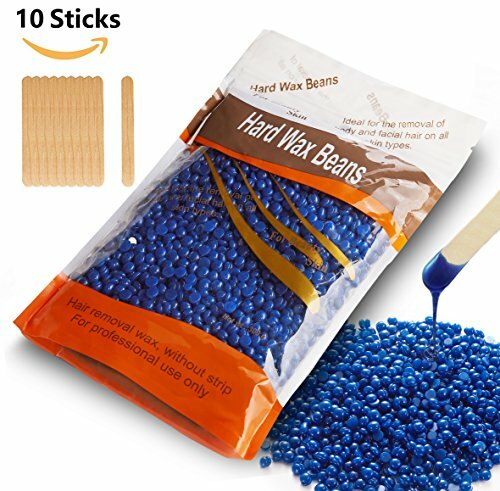 EASY TO APPLY: Melt the wax beans with a wax heater, spread wax onto skin with a spatula along the direction of the hair growth, apply with pressure. EASY TO REMOVE: After the wax set in 40-120 seconds, remove the wax with a quick & firm action, parallel to the skin in the opposite direction of hair growth. PREMIUM QUALITY: Made from certified natural ingredients, safe to your skin, also no harmful chemical VOC when melting. LESS PAIN & NO MESS: Hard wax is more efficient for peeling hair than traditional wax, it’s gentle to skin and without had-to-clean wax residues left on your skin. A Frequently Ask and Question User Guide will be sent to your email address, make sure your email box can receive it. Or you can email us and ask for it. Make your home salon and DIY hair removal easily and simply. You are ensured with 30-days a replacement or full refund if not satisfy, here is a no risk purchase for Auperwel brand high class products. Have you ever encountered such a problem. That you want to wear Bikini and go to the beach, but you are afraid of laughing by the hair on your arms, legs or bikini line Auperwel Hard Body Wax Beans will help for hair removal simply, make you more confident and have more fun. Excellent for strong and fine hair removal. AVE YOUR MONEY AND TIME: With this waxing kit you can do a depilatory at home by yourself.